DIY Wednesday: I'm a Naughty Secretary - how about you? 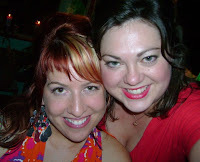 So friends, if you don't get the joke - I am talking about Jen Perkins' uber fab indie biz - The Naughty Secretary Club. Back in 2003 I was just getting my feet wet in the Austin Craft Scene. I was invited out to a meeting called the "Babes in Biz." It was a small group of friends (and I knew NO ONE!) and we met at the Horseshoe Lounge. 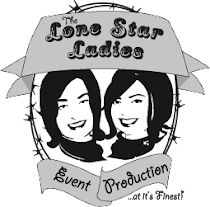 Jen Perkins was there - along with other, now famous crafty ladies - Karly Hand, Tina Sparkles, Jen Arnston, Jenny Hart, and Cory Ryan. Jen was just the sweetest thing ever - she comes from a small town in Texas - which means that she is genuinely kind hearted and nice to everyone. She always made a point to make me and all other newcomers feel welcome and at home. Jen's personality is a big reason for why she is so successful today. Fast forward 5 years and the woman has a new book out! The Working Girls Guide to Handmade Jewelry. Oh, did I mention that she hosts her own TV Show - Craft Lab, and guest writes blogs and magazine articles, and that she has been featured in a zillion articles? This Saturday is your chance to come out and meet Jen - it's her official Austin Book Release Party! CRAFT magazine is teaming up to launch their latest issue, and it's being held at the gorgeous Craft-O-Rama sewing and crafting studio. If you like crafts, and want to be a craft rock star - come on out and meet everyone! I'm going to be helping Rachel of Average Jane Crafter with the make & take craft area! There's also going to be door prizes, discounts on CRAFT mag, book signing by Jen, and a chance to check out all the wonderful fabric and classes offered by Craft-o-Rama. Oh yeah, Amy's Ice Cream is in the same shopping center! WHO: YOU and all your fabulous friends! 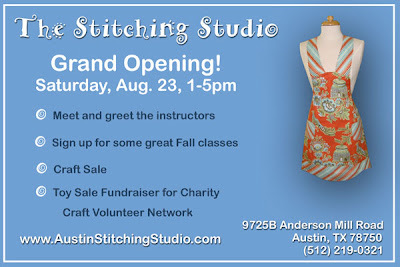 The Stitching Studio Grand Opening! Have you ever wanted to learn how to sew? 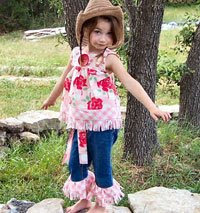 Make clothes for your kiddos or yourself? How about make your own purses or jewelry? The Stitching Studio has you covered! Come join us for a fabulous grand opening this Saturday from 1pm to 5pm. The Stitching Studio offers many levels of sewing and crafting classes, from beginner to advanced. Anne Marie Beard is one of the featured teachers! 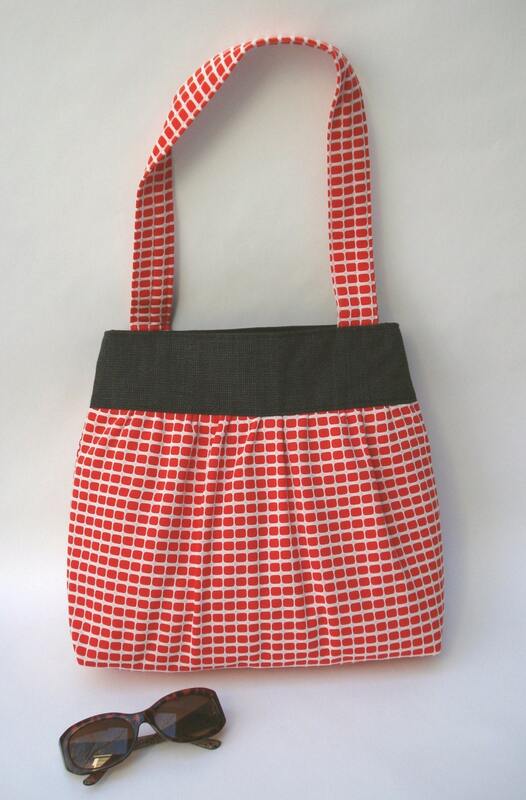 Did you know that she is now working on a line of patterns from her handbag designs? PS: ANNE MARIE IS GOING TO BE HAVING AN END OF SUMMER CLEARANCE SALE! DON'T MISS THIS CHANCE TO GET SOME AWESOME BAGS AT UP TO 50% OFF!!! 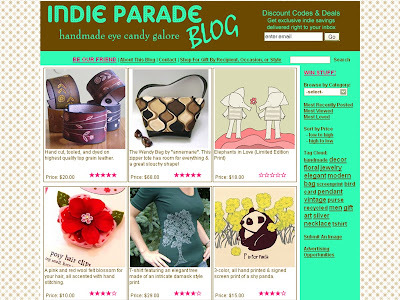 Have you heard about Indie Parade? It's a photoblog that features "awesome things created by independent crafters and designers." The cool thing is that they have items listed by categories. Need a gift for a party hostess? Man friend? Sister? Indie Parade has you covered! 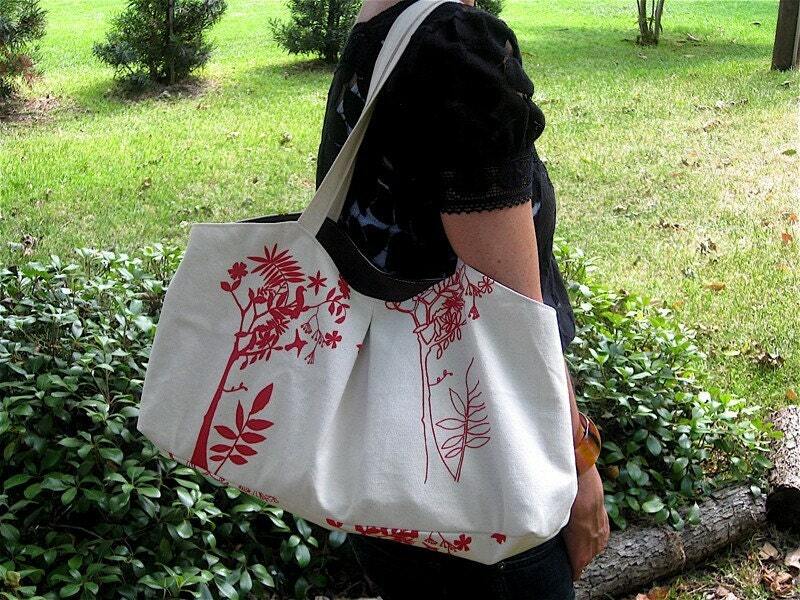 Check out the best in Indie Design, and rank my bag pic, please! 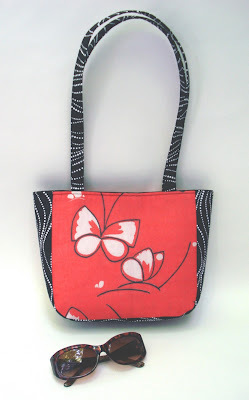 You can also see more shots of the fabulous Wendy Zipper Tote in the *annemarie* Etsy Shop! These days, it seems like anything goes with fashion. Graphic Prints seem to have some serious staying power though! 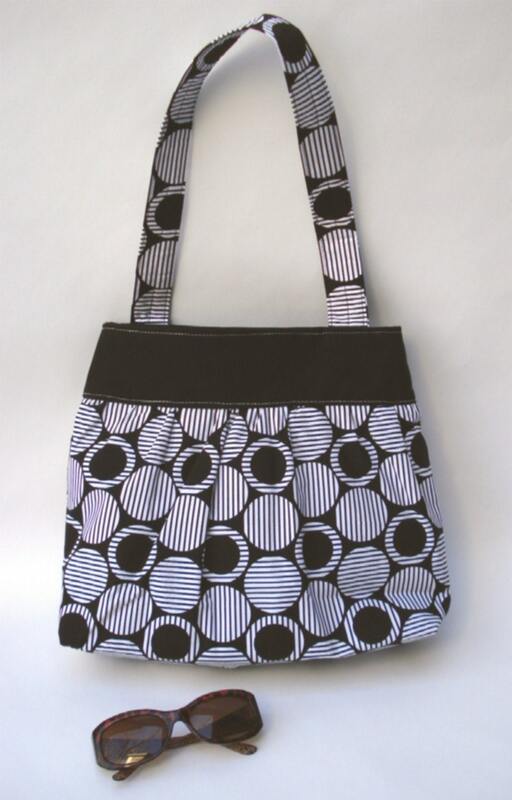 My Paige style bag has been a very popular seller since I debuted it in March. This week I put up some new color choices. Shown here in the Paige Style and made with a 1970s double knit woven with a chic red and white geometric design. Surfs up! Get your Nautical Fix with this purse. 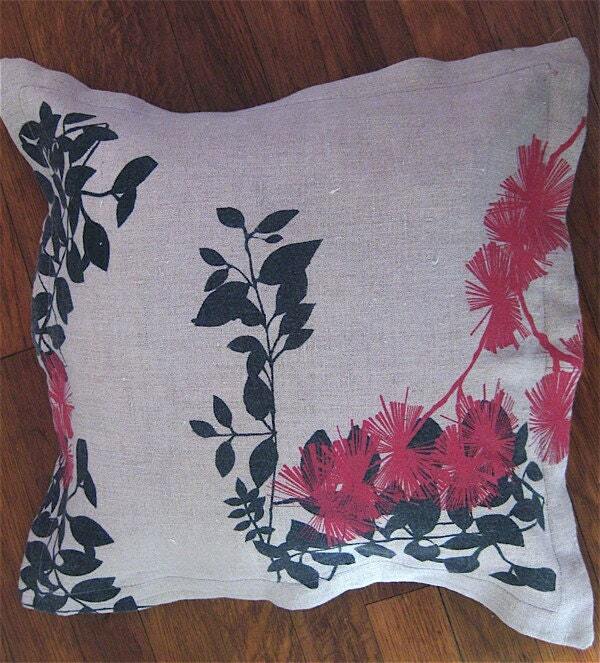 Shown in the Paige Style and made with a cotton print in a Nautical Inspired Circle pattern. For more styles, check out my Etsy shop! Thrift Thursday is all about diggin for gold amongst lots of dirt. Last weekend some of my best friends and I headed down to Wimberley, Texas for a relaxing weekend. Wimberley is a crazy little town - there is not one single straight road there - not one! It's a beautiful piece of rugged Texas Hill Country - lots of oak and cedar trees, tame deer and springs and creeks. Very picturesque - and very hot in August at over 100. We are a group of gals to LOVE to shop! Our favorite kind of shopping is at outdoor flea markets/antiques fairs. For three years we have been making a semi-annual pilgrimage to the miles of shopping in Roundtop and Warrenton, Texas. So for Sarah's b-day, we decided to head out to Wimberley for their famous Market Days. Held on the first Saturday of the month for most of the year, the Market Days are a hodge podge of vendors. You'll find antiques and collectibles (nothing too fancy, though), handmade jewelry, soaps and candles, locally produced jams & salsas, western inspired gifts and a smattering of imported clothes and decor. Our favorites, OF COURSE, are the vintage items... see below for yummy yummy examples of some cool stuff that caught my eye. I have to note the Lions Club of Wimberley - who makes the Market Days possible. It's touching to see (mostly elderly) men out in their bright yellow and blue on a HOT day in August, working concessions, parking lots, and shuttling people back and forth. The Lions Club is a charitable organization best known for their work with eye banks. 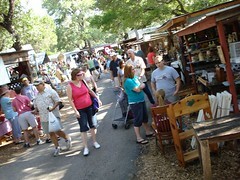 All of the efforts of the Market Days support numerous community programs in Wimberley. Now I call that guilt free shopping! 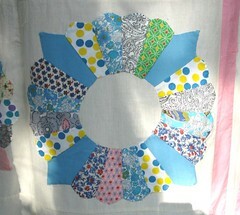 First Up, A FABULOUS hand-pieced quilt in the Dresden Plate pattern. 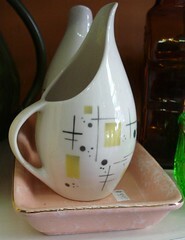 A great pitcher in a design by Modern Living, I think 40s or 50s. Had no luck researching the pattern online. 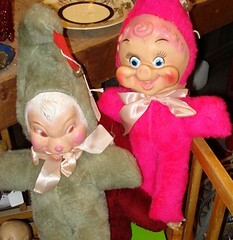 Scary Dolls! And you thought all those hand-made monster plushie dolls were a new fad!!! Lots of Shoppers - I was needing a rest, and it was only 10:30am! 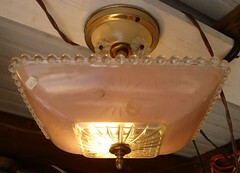 A beautiful vintage light fixture that Sarah bought for her sister's birthday. Apparently, it was a steal at $42, because they're selling on ebay for hundreds! 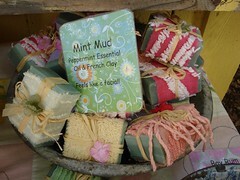 Gorgeously packaged handmade soaps by The Soap Lady of Victoria, Texas. 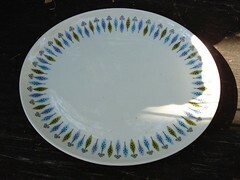 I found my plates!~ I have been searching for a vintage plate set to collect, and now I have it! It's the NORDIC pattern by Syracuse. 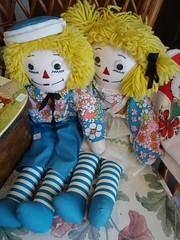 BLONDE Raggedy Ann and Andy? Who ever heard of such a thing? So '60s, and sooo cute! 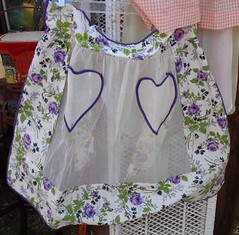 A pristine vintage apron with violet flowers and heart shaped pockets. I would've bought it for my mom, but she has too much stuff! 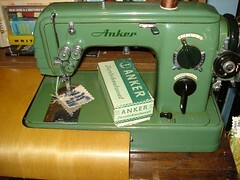 And best for last... a sweet green sewing machine. German model, probably 40s or 50s, great condition... too bad I already own 4 sewing machines...! I first took note of Victrola Designs by Victoria Corbett a few years ago. She and I both sell at a local Austin boutique dedicated to handmade items - Parts & Labour. Victoria's brightly silk-screened tees and totes were located on the shelf just below mine. Any artist knows that her work sells better when it's next to other nice work - so it's always been a pleasure having such beautiful items near my own. I recently had a chat with Victoria about her business and what inspires her to create. Victoria was trained as an artist in her native England, but the Indie Business Owner role didn't strike upon her until many years later. She says "honestly I should have just trusted my intuition and got to it sooner. I didn't learn a lot in art school, due to being so immature and insecure. Experiences in life are whats got me this far......."
I can so relate to that! As a student in College I majored in Costume Design - but most of what has gotten me thus far in business and art have been my life experiences - and the inspiration I find around me. Victoria "loves Asian design more than anything, just the simplicity and uniqueness of the old wood block patterns from two or three centuries ago are genius." I think I'll have to ask her to go see the current Japanese wood block exhibit going on here in Austin at the Blanton Museum of Art! Simplicity and great design aesthetic are what sets her work apart for me. 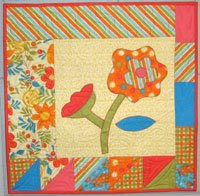 She uses a lot of botanical motifs - often set off by their asymmetry and bold use of color. Recently Victoria launched a new line of products - hand printed canvas custom made into bags she designed. I had the privilege of getting a sneak peak at one of her new bags, and was exceptionally designed and very well made. 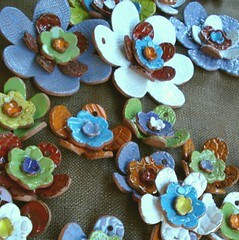 She is now offering them for sale in her Etsy shop - delicious! Keep an eye on Victrola Designs by Victoria Corbett - she has set her sights on global success. She admires the work of Lotta Jansdotter of Scandanavia and Timorous Beasties of Scotland. I'm glad to have such a talented artist in the mix here in Austin - a town she feels "is one of the few places at least in the united Sates where you have the opportunity to live in a pretty place, do what you want and still afford to live." I couldn't agree more.